One of the best things you can do to ensure a nice juicy turkey is to brine it. Brining is Easy! Just gotta plan ahead a lil. In your container mix all ingredients and then add turkey (be sure to remove innards first). Cover, and refrigerate or set in cool area for 12 to 24 hours. 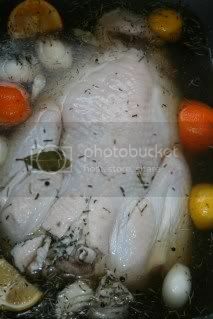 Remove the turkey then drain and discard the excess brine and pat dry and prepare your turkey as desired.